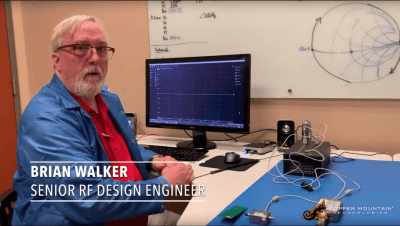 Brian Walker, Senior RF Design Engineer at Copper Mountain Technologies shows how there can be significant variation of performance of a PCB mounted antenna when it is close enough to other objects to disturb the near field response. It is best to measure the return loss of an embedded antenna in its final configuration and be prepared to add matching elements to improve radiation efficiency. Careful consideration of the location of the calibration plane of a vector network analyzer measurement is important to derive matching circuit element values.